The end of 2018 brought great relief for me (and my family and friends!) when I finally handed in my MSc dissertation on the different mechanisms of hip pain in FAI (femoro-acetabular impingement). Unfortunately for the former World No 1 and multiple grand slam winning champion Andy Murray, 2019 was barely upon us when his struggles with hip pain led to his tearful exit from the 2019 Australian tennis open. Later in the month Murray, who was said to be in constant pain and struggling with simple tasks such as putting on his socks, took the radical decision of undergoing a hip resurfacing procedure. Conventional wisdom suggests that it would not be possible to make a return to the top of the elite men’s tennis game. However, the noises from the Murray camp suggest he will try at least try to return with his new metal hip. Can Murray mount a comeback? Bob Bryan, the 23-times doubles grand slam winning champion thinks so, himself having returned to the tennis court just five months after having had the same procedure. Bryan has told the tennis press ‘he (Murray) has been watching me like a hawk, asking me how I’m feeling after matches, after practices, where I’m at’’. The American appears to have made a pretty good recovery himself, having had surgery in early August 2018 he reached the quarter-finals of this year’s Australian Open alongside his brother and doubles partner Mike Bryan, losing out to the eventual winners. Other sports stars to have the procedure include ice hockey star Ed Jovanovski who returned to play a full season of top flight NHL ice hockey before then retiring. Russian Artur Akhmatkhuzin also made a successful return winning a fencing gold at the Rio 2016 Olympics. Colby Lewis a baseball pitcher with the Texas Rangers returned for 3 seasons after having hip resurfacing, following which he produced two of the best performances of his career, twice pitching a near perfect-game (baseball terminology for a game when no player from the opposing team reaches base). Thiago Splitter, had a less successful return to basketball’s NBA, playing only five more games before retiring. Closer to home in more familiar sports such as football and rugby it is currently unheard of a player to return to top level sport having had such a procedure. As impressive in all as the aforementioned return to sports is, it remains to be seen if an elite singles tennis player (who may have to face the rigours of five-set humdingers) can make a return to the top. 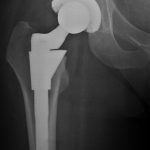 What is the difference between hip re-surfacing and a hip replacement? The essential difference between the two surgical techniques is the greater degree of bone preservation with hip re-surfacing versus a total hip replacement. With a total hip replacement both the ball and the socket of the hip joint are removed (see picture below on the left). With a resurfacing procedure such as Andy Murray has undergone, while a new metal socket is inserted in a similar fashion to a total hip replacement, the existing ball is sculpted and fitted with a metal cap with a shorter stem (picture on the right). 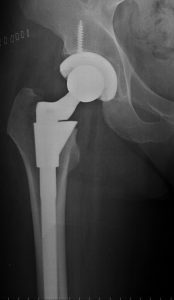 The preservation of bone is especially important for younger patients who will outlive their hip prothesis and need a further hip replacement later in life. A further advantage of a surface replacement is that the preservation of the ball (known as the femoral head) allows for a much larger ball size. This then creates a much more stable new hip joint, facilitating the return to high levels of activity. It is this feature of the procedure which is so attractive to Sir Andrew Barron Murray, and why he hasn’t quite given up hope of returning to the tennis court. 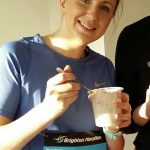 I have hip pain, should I be considering hip re-surfacing? The latest research shows that exercise-based physiotherapy is highly effective for the treatment of osteo-arthritis of both the knee and hip. In most cases those suffering from hip and knee osteoarthritis should first undertake a carefully planned, thorough and progressive strengthening exercise programme prior to having any joint replacement procedures. Patients should commit to at least a 12 weeks rehab programme before deciding if strengthening exercises are of benefit. For patients with advanced hip arthritis, for whom a joint replacement is inevitable, they should discuss with their hip surgeon the most appropriate surgical option. While opinions may differ among surgeons, the current consensus is that in younger, active and especially male patients with advanced hip arthritis, a hip resurfacing procedure maybe the most suitable option. (It is thought that females may be less suited to hip resurfacing due to smaller femoral head (ie the ‘ball’) sizes and therefore a higher risk of dislocation). Posted in Sports, Sports Injuries, Tennis, Hip and tagged hip replacement, hip pain, hip resurfacing, tennis injury. 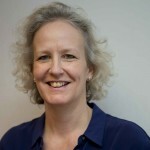 Kieran has 13 years experience as a physiotherapist, working for a number of years in Guy’s & St Thomas’ NHS hospitals before joining Central Health Physio in 2013. 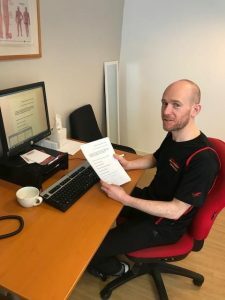 He has a particular interest in both groin and knee pain, while his sporting interests lie in distance running in which he competed at national level in Ireland. More recently he has been turning out for a Saturday league football team.